Extra Strength Gas-X® contains simethicone – the #1 doctor recommended ingredient for the fast relief of gas and its symptoms, including pressure, abdominal bloating and discomfort. Which is why Gas-X® is recognized as the #1 gas relief brand. 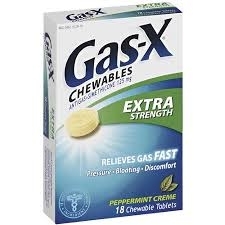 Extra Strength Gas-X Chewable Tablets: Peppermint creme chewable tablet helps with gas pain relief to calm your upset stomach fast Helps relieve stomach pressure, discomfort and bloating. Made with simethicone, an effective gas-relieving ingredient. Chew 1 Or 2 tablets as needed after meals and at bedtime, do not exceed 4 tablets in 24 Hours except under the advice and supervision of a physician.